Found 8 file extension associations related to Orchida Embroidery System and 6 file formats developed specifically for use with Orchida Embroidery System. 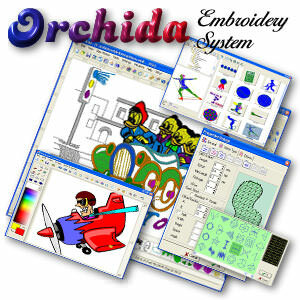 Orchida Embroidery System offers you endless possibilities for creating unique embroidery with just a few clicks. OES will assist you in generating embroidery designs directly from artwork. You can use clip art, photographs, scanned images or your own illustrations. Create lettering and symbols using a variety of True Type Fonts™ which are already available on your computer. Adjust and manipulate embroideries by selecting different stitch types, pattern options or outlines to add interest. You have the ability to arrange your embroidery designs any way you want. OES can be used with a number of different embroidery machines as you can import/export embroideries in the most popular machine formats, including Tajima, Brother, ZSK, Barudan, Pfaff and Happy. Use a variety of editing tools to adjust an existing embroidery design or use your own creations. Create your own Fill patterns or edit any of the present ones. Design personal motif stitches which can be used to outline or to fill portions of an embroidery design. Rearrange the stitching order of the design in the Filmstrip to suit your needs, or let the program automatically figure out the best stitching order. OES is designed to create Embroideries and will directly communicate with any embroidery machine. You will not need any other Transfer Program, or any device designed by your particular embroidery machine manufacturer. If you need more information please contact the developers of Orchida Embroidery System (Orchida Soft), or check out their product website.